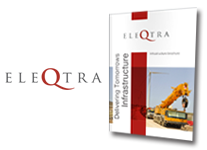 eleQtra is the principal developer of InfraCo Africa. Through eleQtra’s management and now as its Principal Developer, InfraCo Africa acts as an ‘honest broker’ seeking to create viable infrastructure investment opportunities. InfraCo Africa is owned by the Private Infrastructure Development Group (PIDG). PIDG is a multi-donor member-managed organisation set up in 2002 to encourage private infrastructure investment in developing countries. Current members include: UK Department for International Development, Australian Government Department of Foreign Affairs and Trade, Swiss Federal Department of Economic Affairs, Education and Research (SECO), KfW, Netherlands Ministry of Foreign Affairs, Norwegian Ministry of Foreign Affairs, Swedish International Development Cooperation Agency, Finance for Development and International Finance Corporation. PIDG has founded a range of specialised financing and project development subsidiaries designed to overcome the obstacles to generating private sector investment in infrastructure projects in poor countries. As new obstacles emerge, these companies respond with custom-made solutions. DevCo, managed by the World Bank Group’s International Finance Corporation, provides critical financial support for structuring transactions to facilitate sustainable private sector participation in infrastructure in poorer developing countries. Many infrastructure projects, particularly at the municipal level, derive most of their revenues in local currency, making hard debt funding inappropriate. The PIDG established GuarantCo to mitigiate risks for local currency financing of infrastructure. Infrastructure Crisis Facility – Debt Pool provides direct finance to infrastructure projects in emerging economies. The Fund is available to all private infrastructure projects originated by International Financial Institutions. InfraCo Asia is an infrastructure development and investment company which aims to stimulate greater private sector investment in infrastructure in South and South East Asia’s emerging economies. The Technical Assistance Facility (TAF) is a pool of funding within the PIDG Trust to assist PIDG companies to support capacity building and to help scope out potential investment opportunities. The Emerging Africa Infrastructure Fund (EAIF) is a Public Private Partnership able to provide long-term debt or mezzanine finance on commercial terms to finance the construction and development of private infrastructure.